When we moved into this house, the kiddos' bathroom was just your plain, old builder's grade bathroom...and it was really boring!! 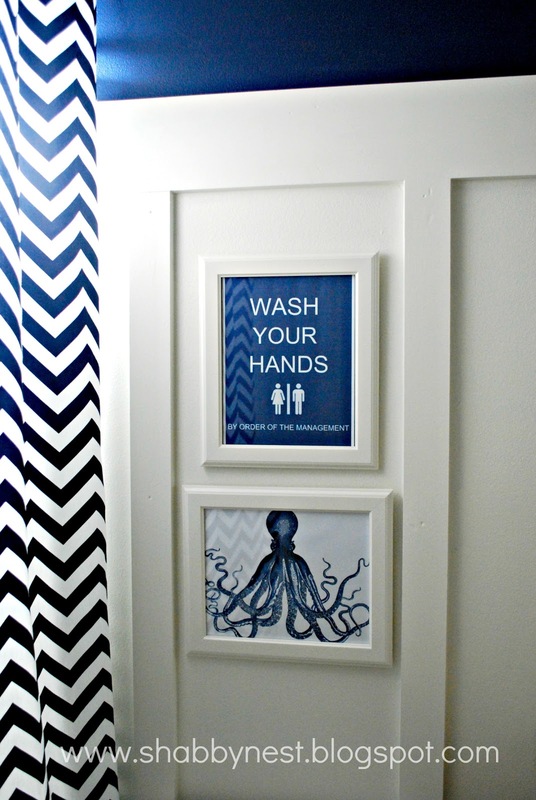 When I was coming up with the plan for the bathroom, I knew that I wanted to add some architectural interest to the space. 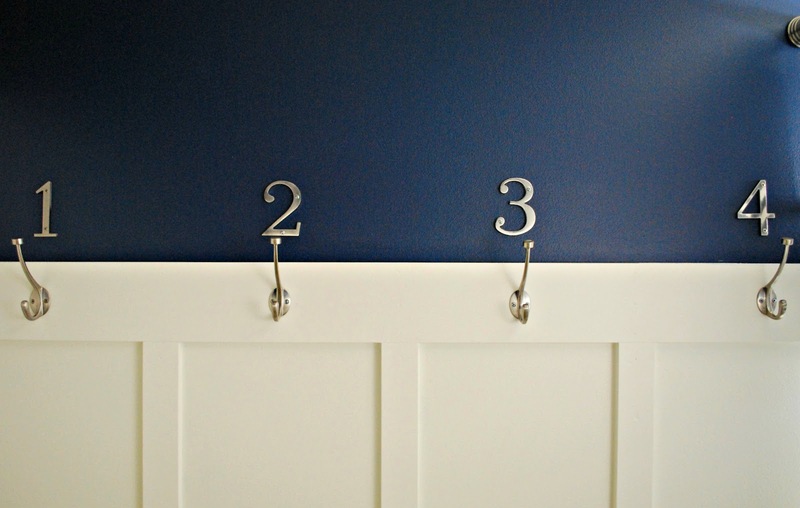 I love wainscotting, and I thought that a tall board and batten would be the perfect addition to the space. The hubby was on-board from the start. 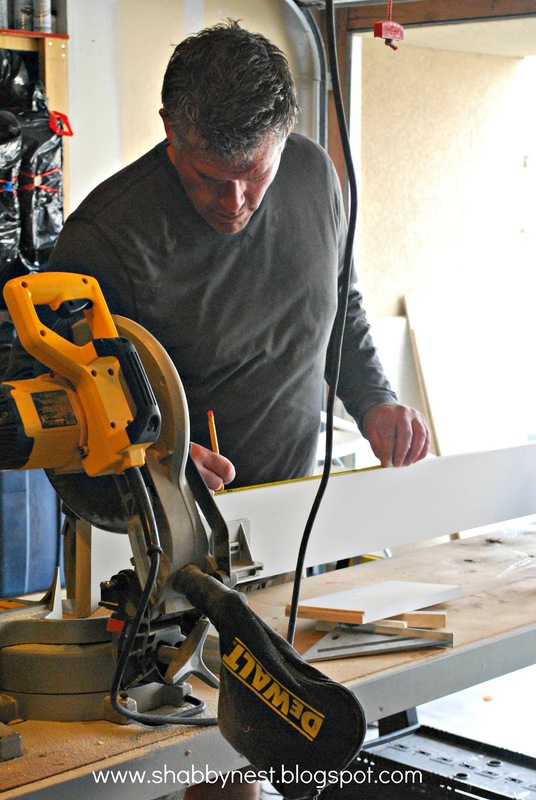 Which is good seeing as how he is the carpenter and all, and I was going to need his help to do this project. There is a "correct" carpenter's way of doing board and batten that involves insetting a wooden backing into the sheetrock. We discussed doing it that way, but decided that given the room and our budget, it was not the best or most cost-effective way to do it. So we opted for the easier DIY version of board and batten. Now, there are about a million and one of these fabulous board and batten tutorials on the interwebs, so I'm not going to do a tutorial here. And since the hubby is an expert with this stuff, we didn't use one either. We just figured out the measurements, and he went to town. I do want to talk a bit about the caulk, however. Here is the hubby cutting the wood for what was to become the board and batten. After he attached the wood to the wall, he caulked it using DAP ALEX PLUS caulk. 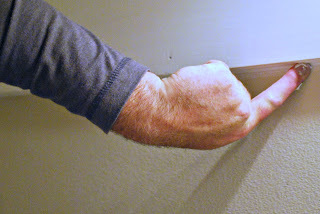 And after he added a bead of caulk at the seam where the wood meets the wall, he wet his finger under the faucet and used it to smooth the caulk. Once the caulk was dry (it has a fast drying time - about 2 hours) we were able to paint right over it. And it looks fabulous! According to the DAP company: DAP ALEX PLUS is America’s number one selling brand of caulk. It is a superior quality, all-purpose acrylic latex that can be used indoors and out. It is paintable with both latex and oil based paints, and has a waterproof seal. When used in common household painting projects, DAP ALEX PLUS seals around baseboards, trim and molding, filling gaps and providing a professional grade look to any project. We chose to use the ALEX PLUS caulk primarily because it is waterproof - and well, we were using it in a bathroom - and also because it is paintable. If you are just using caulk between, say, tile and a countertop, the paintable part isn't that important. But because we were using it to seal the wood to the wall, and we needed to be able to paint both the wood and the wall...the paintable quality was really important to us. We're so happy with how this project turned out! The board and batten treatment simply makes the room! If you missed it, you can check out the entire project here. 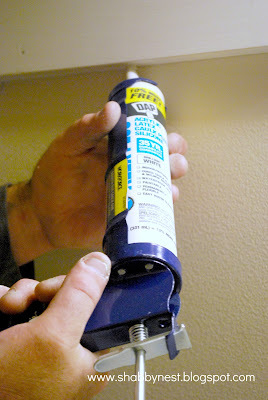 DAP partnered with bloggers such as me to promote their caulk and sealant products. As part of that program, I received compensation. They did not tell me what to purchase or what to say about the products used. DAP believes that consumers and bloggers are free to form their own opinions and share them in their own words. DAP’s policies align with WOMMA Ethics Code, FTC guidelines and social media engagement recommendations.The winner of this giveaway will be randomly chosen and gift card fulfillment will be handled by a third party. The board & batten really does make the room. We did this also in the kids playroom downstairs. It turned out fab and I absolutely love it. I want to do it in other rooms now as well. I really love the dark color you've chosen, so classy...and the prints are super stylish! Love it! Would really like to know where to get the wash sign.... I have three kids and think that would be a great addition to their bath. I love the new look! It's so fresh and bright! I'm trying to talk my husband into board and batten in our foyer. 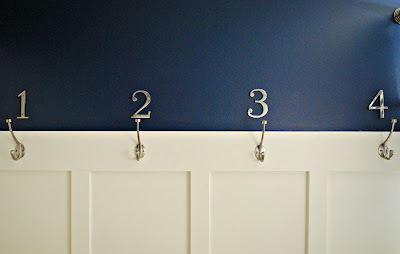 I love the numbered hooks-- those would be so cute for my boys' coats and book bags. We keep going back and forth on whether or not to try this in our stairway. It sure looks the same as going all wood, so why not right?